INPUT CHARGE CONTROL: The setting of this control determines the amount of charge taken in by the heater, which in turn determines the temperature of the heater`s storage core. ROOM TEMPERATURE BOOST: Dependant upon the amount of charge taken in by the heater, the Room Temperature Boost control allows the release of additional heat by means of a damper. 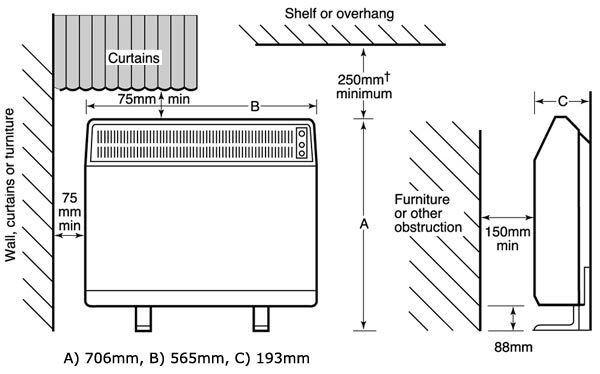 CONVECTOR: The CXL12 incorporates a convector ekement in the front of the heater which may be used independantly of the storage heater, for example, as `top-up` on cold days. 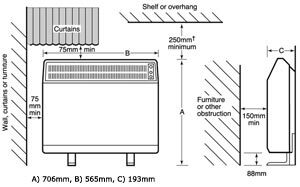 The CXL12 Combination Storage Heater has an inpuit rating of 1.7kW.